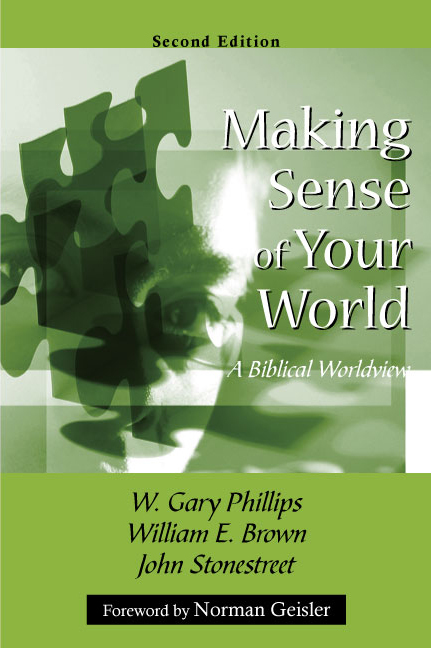 Making Sense of Your World offers a basic, accessible introduction to biblical worldview that covers all of these aspects of world-view thinking. Part One compares the basic worldviews, Part Two contrasts (and seeks to defend) the biblical worldview with the others, and Part Three constructs a biblical worldview in four key areas. This book is an overview; the Christian thinker is invited to continue his or her study through the recommended readings at the end of each chapter--an ongoing task Paul labels the 'renewing' of our minds (Romans 12:2). "The truth is that everyone has a worldview. The tragedy is that many people think and live by their worldview and do not take the time to analyze what it is or even whether it is true. The truth is that a worldview is like colored glasses; it colors everything at which we look. It is a grid through which one views all of life. As such it helps form our thoughts, values, and decisions. The tragedy is that most people do not even know what their worldview is, how they got it, and how important it is in their lives. Making Sense of Your World was not only one of the first on this subject (in its first edition), but it is one of the best. It comes from experts in the field who have decades of experience in teaching worldviews on the college level..."
Is life worth living, or is it a meaningless absurdity? How one answers this question sets the stage for how (and even why) one chooses to live. Disagreement about how to answer this question, and whether it is a question even worth caring about, cuts deeply into the fundamental differences among religions and philosophies. Mencken's way is by far the easier path to travel. A meaningless existence requires nothing from anyone. There is no need to check for bearings along the way, no need to justify one's choices, values, or goals. Life is a lark at best, a tedium at worst. Such a philosophy agrees with Brendan Gill, who once quipped, "Not a shred of evidence exists in favor of the idea that life is serious." On the other hand, despite our attempts to ignore these sorts of issues, there exists a 'quiet desperation' that drives humanity to think about the question, "Does life have meaning?" Deciding that life does have meaning is not the end but the beginning of a quest. Life becomes a continual pilgrimage to find, affirm, and reaffirm a philosophy of life. One may join a church (or leave a church), change religions, switch jobs, get married, get divorced, or make any number of changes in an attempt to find meaning and purpose. This is the stuff of worldviews. The tragedy in American culture is that thinking has been trivialized by distraction, pragmatism has replaced principles, and 'how' has displaced the more profound question, 'why?' Robert Bellah describes a woman whose worldview epitomizes many: "I just sort of accept the way the world is and then don't think about it a whole lot." The results of this approach are the autonomy and individualism that are so much a part of current American public thought. 5. Why a Biblical Worldview?